Mates running late? Spare hour on a Sunday? All you need is an empty car park to improve your riding. The best mountain bikers in the world all have one thing in common: they all use their hips to control the bike and dictate their position. More neglected than most skills, you can actually practise synchronising your hips with your head and legs by doing some exaggerated turns on any flat piece of ground. Try leaning the bike over while swinging your hips and dipping your outside pedal at the same time. The more you lean, the more the pedal and hips should move. With your thighs parallel, look to where you want to finish your turn and lean the bike over. As the bike leans and your outside foot drops, push your outside knee in towards the top tube and let your hip swing out. Your shoulders should remain almost flat but never tilt outwards towards the outside of the bike. A low centre of gravity is crucial, so imagine you are steering the bike not with your upper body but with your hips, legs and feet. For the skiers among you, think of the perfect parallel turn. It’s almost the same movement. 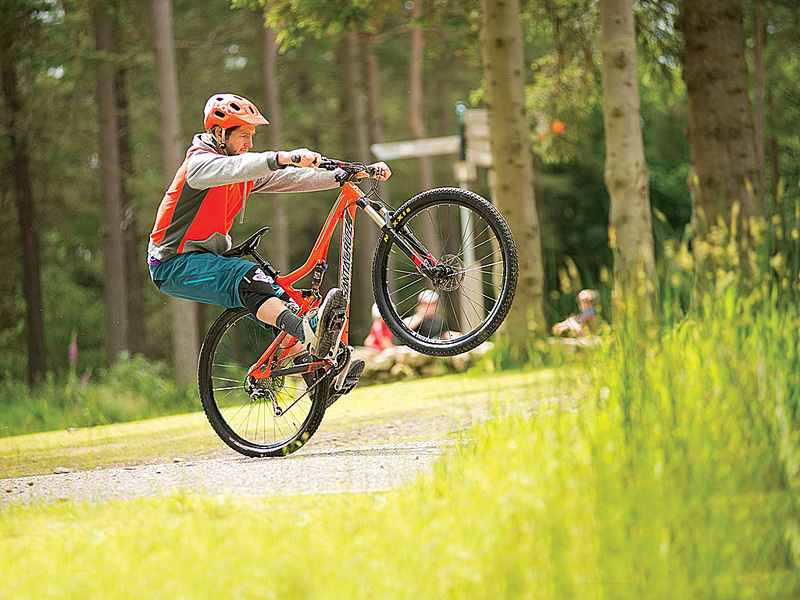 The humble wheelie, beloved of teenagers and victorious XC racers, may not seem worthy of the discerning, respectable and responsible mountain biker — but the ability to lift your front wheel at low speed is actually vital for getting up and over trail obstacles. Forget the distance you hold the wheelie for and concentrate on the balance and timing of the lift. 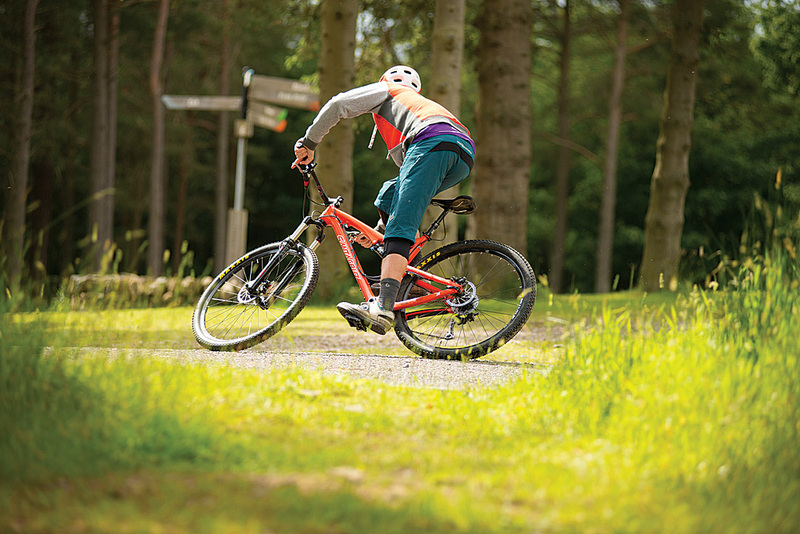 Keep your bum in the saddle, make sure your arms, handlebars and shoulders form a square, choose a gear that provides some resistance but isn’t too hard, and place a finger over the rear brake lever. Now lean back from your shoulders while you push on the pedals. Your arms should remain straight and your hips fixed in the saddle, allowing the lift to be 100 per cent body weight and almost zero per cent strength. Let the lift come from your upper body pivoting around the rear axle while your pedalling causes the rear wheel to move forwards below you. Keep your head up and remember — if you’re pulling on the bars, you’re going wrong. How many times have you been sitting in your car at traffic lights while a bike courier elegantly balances in front of you? The track stand is often overlooked by mountain bikers, but the simple skill of standing upright and pausing while staying composed actually underpins most technical climbs. The ability to stay upright with your feet on the pedals will buy you valuable time in numerous situations. 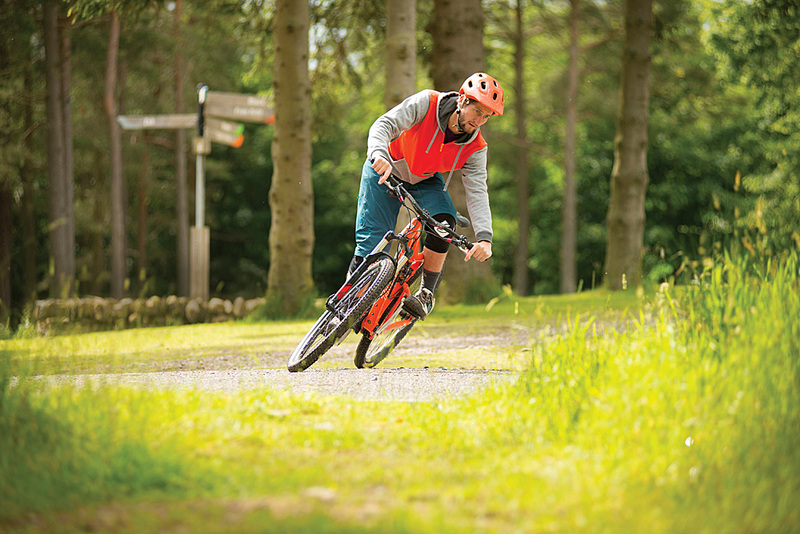 Next time you’re waiting for your mates, find a mellow uphill gradient, roll to a stop, turn your front wheel to your preferred side and stand upright. 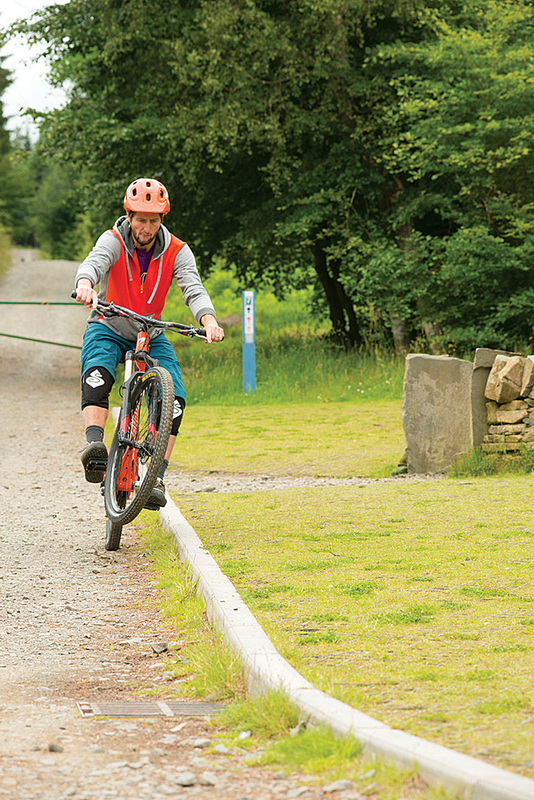 Hold the bike still by using tension through the chain, not by pulling the brakes. A gentle rocking motion forward and backwards will allow you to fine-tune your balance, and straight arms and an upright back will give you a platform from which you can roll your hands on the bars in all axes. The big mistake is to crouch with bent elbows or knees. Get your limbs straight and keep your head up. 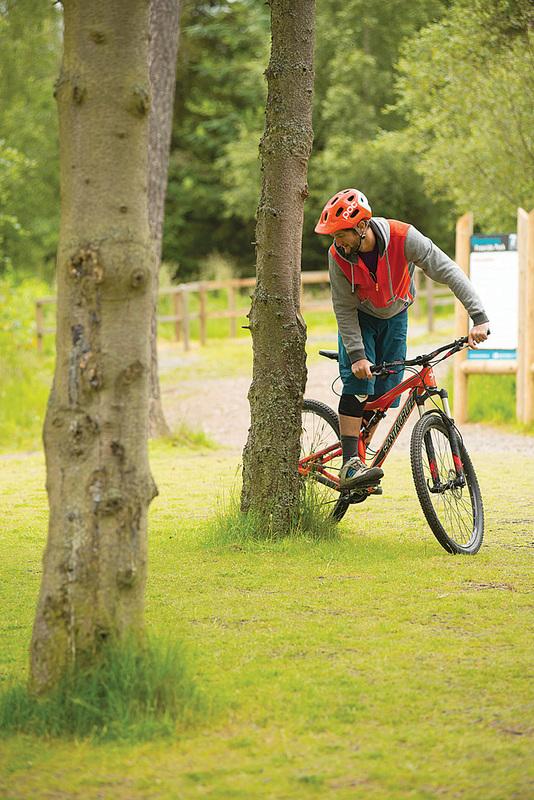 Controlling your bike at slow speeds is so important, so find an object and see how slowly you can turn around it. Make sure you remain composed, learn to use your body and bike individually, and if you’re wobbling around, straying off line or putting a foot down, then persevere. It’ll feel awkward but, unlike faster corners where leaning gets you around the bend, turn your handlebars to steer. Get used to using the momentum of the bike and how your upper and lower body movements affect your balance. You should learn, over time, how to regain balance and when it’s right to move your shoulders and when to move your feet, legs or hips. Making, then correcting, these mistakes is the best way to learn. 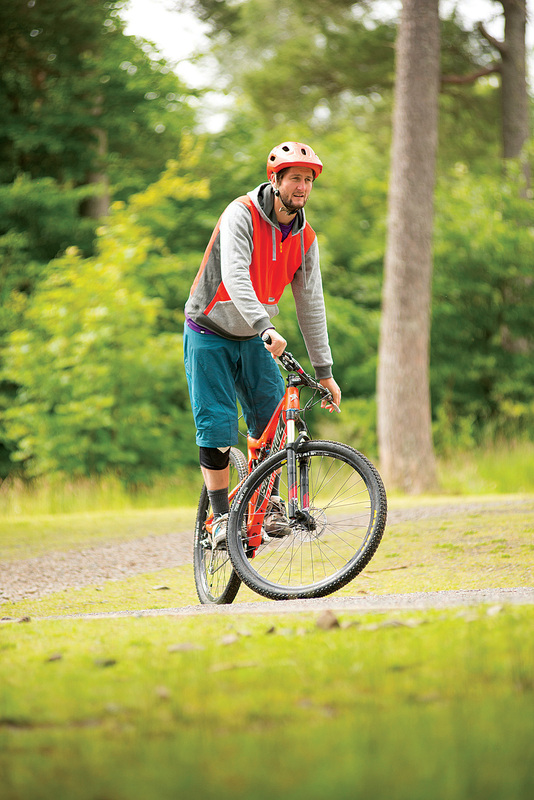 For a manual — unlike a wheelie — you need to be standing up rather than sitting down, and you use body movement, not pedalling, to lift the front wheel. That means it’s perfect for when you’re travelling at speed. Imagine someone has tied a rope around your waist and is trying to pull you off the back of your bike as you ride past. This would replicate a manual. Start standing up, rock forwards if you’re going slowly to initiate some momentum, move back quickly from the hips and let your arms straighten as you go back. Your head shouldn’t lift and you should use as much room behind the saddle as you can. As your hips start to pass beyond the saddle, dip your heels and straighten your knees, helping to push the bike forwards. The reliance on your lower body will keep your centre of gravity low, perfect for high-speed and technical trail situations. Just like the wheelie, make sure your arms, handlebars and shoulders are forming a square. Once in position over the rear wheel, hand responsibility over to your legs. Keeping your upper body in the same position, straighten and bend your knees to maintain your balance point. Cover your rear brake in case you’re overbalancing. 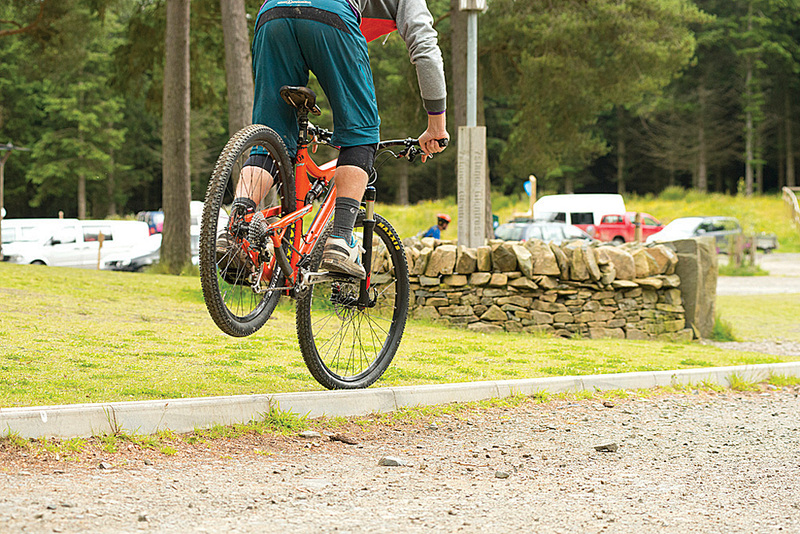 Used by the pros to change line mid-descent or to get themselves out of nasty, unseen, wheel-catching ruts, the side hop is a very useful skill to have in the locker. First you need to have mastered the bunny hop, and that means relying on skill and timing, not your SPDs. To get some sideways movement into your hop, use your arms and shoulders to twist and turn sideways while the front wheel is lifting. You’ll need to add the turn in throughout the first phase of your bunny hop, meaning you’ll be moving up and sideways at the same time. The most common mistake is to force a sideways movement in after your hop is done, or even before it’s started. With your arms moving up and sideways, let your hips follow the same path to lift the rear wheel. Remember, you should be taking off front wheel first and landing front wheel first or with both wheels at the same time. There should be very little resistance throughout the whole move; instead your upwards arch and sideways shift should be linked at every stage of the movement. Though this trick isn’t relevant to anything in particular, it’s about developing a close, coordinated link between bike and rider, your general awareness and the ability to move your body without losing balance. It’ll also teach you how to move your wheels up and sideways independently and help you gain some accuracy with your wheels. 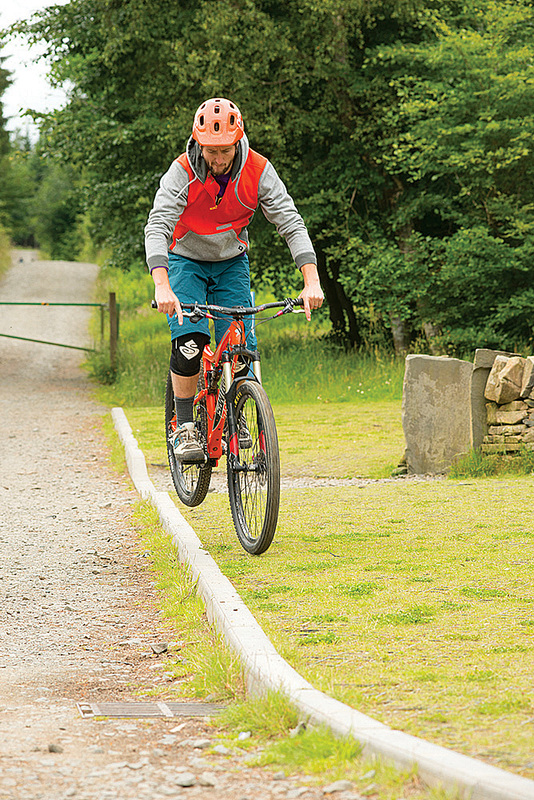 Find a little step or kerb and ride parallel along the top. Move your weight forwards and upwards while flicking your heels up to lift your rear wheel. It’s just like a normal rear wheel lift, but this time, subtly move your hips to the side, making the wheel lift diagonally instead of straight up. With the lift occurring, roll your hips upwards and backwards again while lifting the handlebars to get your front wheel airborne. 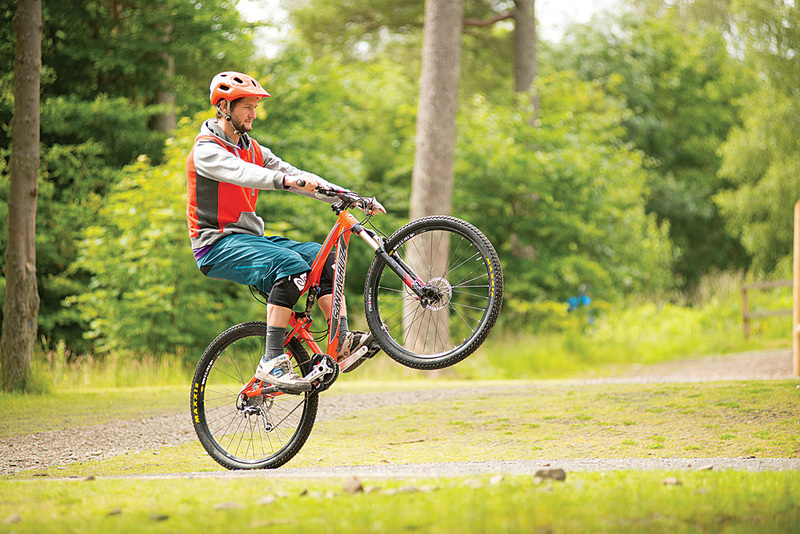 It’s likely that you’ll land back wheel first or with both wheels at the same time. The hard part is dropping your rear wheel off the kerb first as you can’t see where you’re landing it, and taking off back wheel first is a very strange thing to try. But the more you dial in these awkward skills the more you’ll be able to accurately place the bike on the trail. 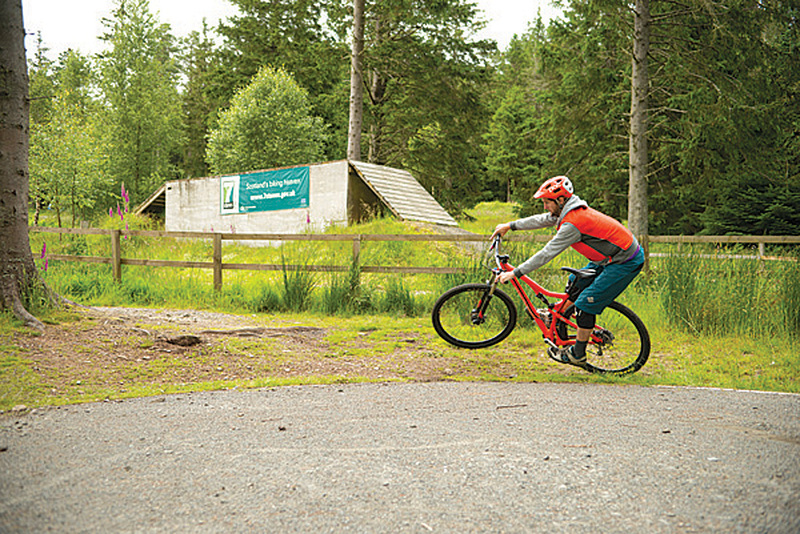 Slow speed control is something you’ll use all the time, whether balanced on some wooden ‘North Shore’ monstrosity, trying to ride a narrow passage, or taking on a technical climb. Every car park has a kerb or two to roll along while passing the time. 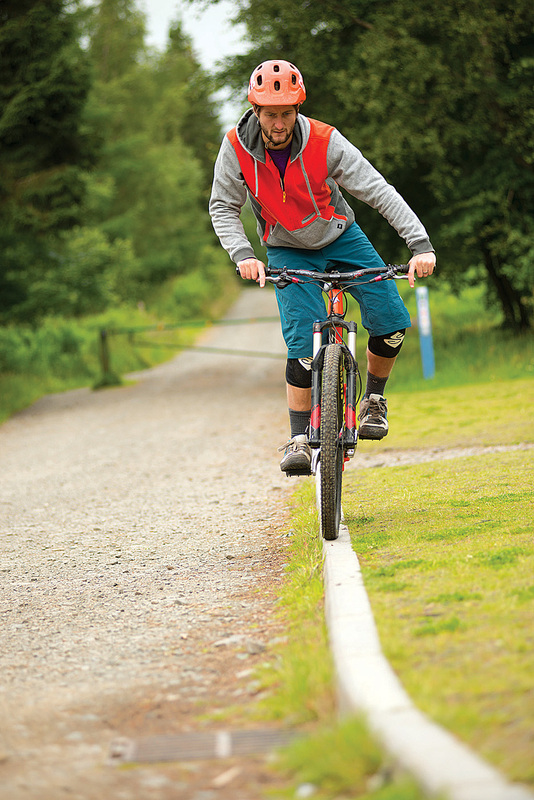 Set yourself a challenge: how far can you get along the kerb? How slowly can you do it? To be successful, you’ll need to keep either your bike or body upright, never allowing both to waver sideways at the same time. This coordinated yet individual movement of the bike and body is a key skill to practise and one many riders don’t have. Let your shoulders, hips, hands, arms and legs move side to side with your bike but never your head. Keep looking along the line finding an imaginary point a few metres ahead of your front wheel. Immortalised in Alex Rankin’s Earthed DVD series, the cuttie was a southern hemisphere import that has stuck around ever since. 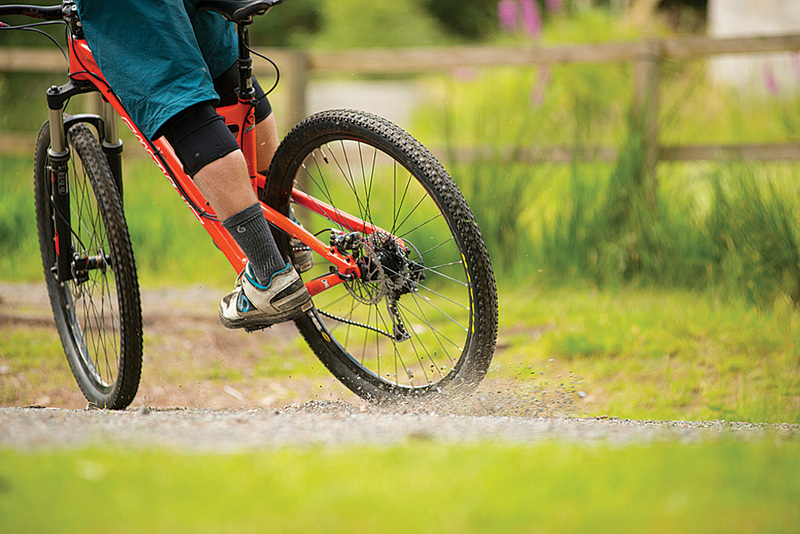 Not one for those on flimsy wheels, the cuttie promotes confidence and aggression when you’re lacking traction. A new era of young riders who can cuttie well also ride their bikes with more fluidity and flair, and they’re happy holding a line when all grip has gone. Firstly, it’s not about brakes but about body movement. Your aim is to slide the rear wheel sideways without pulling the back brake on. Find a patch of ground with a loose surface and in one fluid movement put your weight onto your hands and flick your rearward foot sideways with your hips following behind. You’ll really need to go for it and put your whole body into it to get the back wheel sliding — and developing the confidence to do that is beneficial in itself. Most people end up skidding (back brake on) or hopping the back wheel when they start out — make sure all movement is sideways and that you push the rear wheel to the side, not pull. Don’t forget to practise both ways. Believe it or not, the forward and backward body movement and weight bias needed to handle G-outs in a fast corner and pumping berms for speed can be mapped out at walking pace in a car park. When cornering aggressively or quickly, you need to transition from front wheel pressure to rear wheel pressure throughout the bend. Find a small bank or ledge you can initiate a turn against. The aim is to turn against the banking while starting a manual and pivoting around the rear wheel to finish the turn. You’ll need to move your shoulders forwards into the bank and then, as the front wheel turns and your hips whip around, move your bodyweight backwards, lifting the front wheel. Be led by your hips, but link your feet and shoulders into the movement too. It sounds complicated but in reality you’re just adding the moves in a manual to the moves in the flat corner carve. Always look to your exit point and let your body move around your head to help with balance and stability. Remember that the best bike riders in the world are able to link movements and skills together to handle a situation — where better to practise than in a car park?